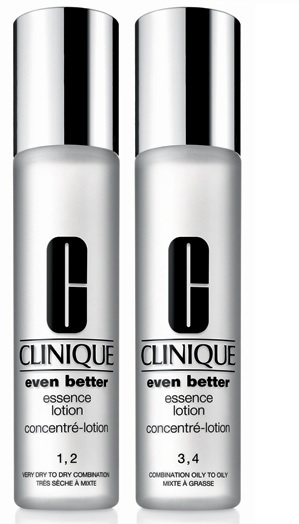 This week I'm obsessed with... Clinique Even Better Essence Lotion! Clinique Even Better Essence Lotion - $53 - in 2 types: 1,2 Very Dry to Dry Combination and 3,4 Combination Oily to Oily - with a light, non-greasy lotion formula which activates the skin's moisture retention power, instantly hydrates skin, revitalizes dull skin and provides long-term moisturization, helping to improve overall clarity and radiance for skin that glows from within. It looks like a toner and you will be tempted to splash it on like one but it's not, so don't - think of it more like a serum, apply a few drops to your fingers and pat it into the skin and get ready for your radiant glow! Available at Clinique counters across Canada and online at www.clinique.ca.